Ever since that afternoon I spent at Violet Cakes however long ago I have been besotted, foolishly besotted, by a macaroon. Everything else of that afternoon seems distant in my memory now, apart from that golden, crispy, syrupy rounded mound of baked coconut. Before my near death experience involving sugar, my only knowledge of a macaroon (the real deal, not the contemporaneous meringue kind, I’m talking about the poor macaroon that was overshadowed by that) came from a packet of 4 overly chewy macaroons commonly found in my aunts, or even dating back 10 years ago, my late nan’s flat – where there would always almost certainly be a packet of chocolate dipped store bought macaroons. But hey, I knew no better, and I still ate the whole bloody packet. Who says the coconut cant be desiccated?! 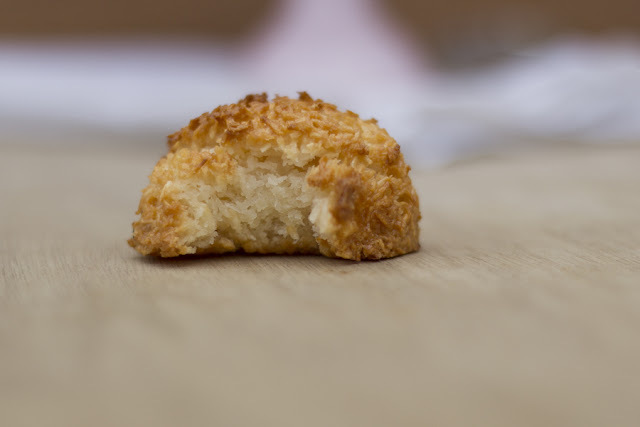 The recipe for Violet’s delicate, perfectly proportioned macaroon can thankfully be found in Leon’s Baking &Pudding’s book – I will take this moment to mention how lucky we are that Ptak & the founder of Leon live in the same neighbourhood. Leon is one of the best food chains in England, but truthfully, I bought their book for the macaroon recipe but I’m sure I will be dipping myself into some more recipes such as the Lemon Bars fairly soon (as should the poor soul reading this). What really sets this recipe apart from the rest is the addition of honey; it makes the world of difference through extra subtle sweet flavours on top of that already coming from the caster sugar (trust me, it works). It also makes the macaroons extra sticky, so sticky you will need to keep your paper towels well away until its time to wipe the stickiness from your fingers - licking is totally acceptable btw. Place all the ingredients except vanilla into the saucepan and stir on medium heat until the sugar has dissolved and the bottom of the pan leaves bubbles when scraped across - about 7 minutes. Take off heat and leave to cool completely, about 15 minutes. Place baking parchment over a baking tray. Scoop level amounts of mixture straight onto the baking tray making sure they are slightly spaced apart. I used an ice cream scoop to get uniform macaroons. Leave the macaroons to cool completely before removing from the parchment. This allows the macaroons to crisp up. The macaroons will lose their crispiness if stored in an airtight environment, so try to eat them ALL on the day of baking! So, here's the big question that's playing on both our minds - do you plunge yours in chocolate or leave them raw?